Going through our late Dad’s (and Mom’s) belongings is very interesting. For instance, what was formerly merely an item, an object, or a thing, is now an artifact, and has therefore gained a value it did not have before. Even things they owned — and did not use — are precious. The glasses that were only for company. The handkerchiefs neatly folded in the sachet. How can I just give these things away when they meant so much to our parents that they kept them, unused, for years? Someday soon I will realize that grasping these objects is not going to bring back my parents, not even for a moment. But not now. Now I will put the items into boxes and store them. The irony of this is not lost on me. But there is a lesson here for me. If I don’t use something I will give it away. It has to be that way. There is no sense in moving into a smaller, simpler home if I don’t adopt a smaller, simpler life. Dragging all my belongings with me like some great carapace is not going to protect me or nurture me. As a side issue, we found a file with all the important papers in it carefully locked in the strong-box my parents kept. There was even a list of things to be done when they died (we followed it to the letter). But there was no will for my father. Oh, there was a copy of the will. But no original. The copy had the name of the lawyer who had drawn it up. He moved away many years ago. I googled his name and found his ex-partner in the law practice. He had a number of an office where the original lawyer worked. Or at least where he used to work. But they gave me his cell number and eventually I was able to leave a message. There were two things that made this “not a big deal”. One was that everything was in my sister’s and my names. So we could move ahead with things that had to be done. The other was that when we showed up at the government offices and told the nice clerk our father had passed away, she said she was sorry, and then asked if we wanted to perform a will search. So apparently this is not an uncommon occurrence. We’ve heard from the lawyer who has the will and he will send it to me. But I will a) update my will, and b) organize my papers to make sure I can find everything when I need it. This method looks like it could work for me, as I am an unrepentant “piler”. And I will go paperless as much as I can. Posted in Laneway House, Life. Bookmark the permalink. I believe you know I am a supporter of living small. I was just in a neighbourhood a few weeks ago that had undergone a change in the other direction. I remembered a neighbourhood close to our new house that had been primarily small bungalows that had been constructed in the late forties. The entire area had been built for returning soldiers after World War II, and had been street after street of similarly designed homes of 1000 to 1500 square foot size. I’m a boomer, and when I was small we lived in a house much like this — maybe you remember homes like this — two bedrooms on top (your Dad probably put another in the basement when you and your siblings outgrew the one bedroom). One bathroom for the whole family. An eat-in kitchen or a tiny dining room. But when I saw the neighbourhood again recently, I had to look for these old bungalows — they had been replaced by McMansions. I felt a real sense of loss. But I understood why. If you visit the site Crack Shack or Mansion, play the game to see if modest bungalows like the one above are dilapidated shacks or worth the price of a mansion in another city. Who am I kidding — a dilapidated shack in Vancouver IS worth the price of a mansion almost anywhere else. Because it’s all about the price of the property. I can understand why someone who buys one of these homes would tear it down, and for another $300K or $400K, build a huge home that dominates the lot and leaves no yard to speak of (or play in). Bob Schwartz, chief economist of Pitney Bowes Software, which did the analysis, said two- and three-bedroom houses were becoming ”too small” for the Sydney housing market. I am hoping that the option of increasing the living space in the home by building laneway homes will slow or stop this trend. As nice as these large houses look, it doesn’t increase the densification of the neighbourhoods, and it completely changes their character. Posted in Cities, Housing, Laneway House, Small House and tagged Decor, Lane Home, Lane house, Laneway House, Neighbourhoods, Vancouver. Bookmark the permalink. Meadow Lake is a city located in north west Saskatchewan, Canada about 246 kilometers north east of Lloydminster and 156 kilometers north of North Battleford. So, out of the main hustle and bustle, then. And it looks like a lovely place. Lots of amenities, and tons of fresh air and open spaces. An up-and-coming place, with people moving there all the time. If Meadow Lake hopes to live up to its title as a ‘city’ and become a real urban centre, it needs to look at alternative forms of housing. As it stands, the city faces a shortage not just of affordable housing, but of purpose-built rental units in general. Ask any young professional what the rental situation is like here and they will lament on the challenges on finding a decent apartment. Basement suites are more common, but self-contained rental units are rare and as a result are priced at a premium. But they are doing something about it. By calling for densification through laneway and coach homes. Many municipalities are only now learning the true cost of urban sprawl, as long commutes increase emissions, congest city streets and put further strain on our infrastructure. But there is a way to embrace alternative housing and increase the density in our residential neighbourhoods while still meeting fire, safety and accessibility standards. Council should put their heads together and figure out the best way how. Of course, I am a fan of densification in residential areas — and it’s good to see that others are seeing the value in it. Posted in Cities, Laneway House and tagged Lane house, Laneway House, Neighbourhoods. Bookmark the permalink. We think of the prairies as wide open spaces, with lots of room to build. But Regina, Saskatchewan is seeing the benefit of housing densification within its cityboundaries. The City of Regina is considering a zoning change that would allow for the development of 11 laneway homes on a single block in the Greens on Gardiner. Currently laneway housing or any secondary suite not attached to a single family home is not permitted. Looks like laneway homes are the way of the future in many urban areas. Posted in Cities, Laneway House, Small House and tagged Lane Home, Lane house, Laneway House, Neighbourhoods. Bookmark the permalink. All last week I’ve been home from work with a pinched nerve in my back. Ugh. Also OW! I’m taking a prescription that will help alleviate the nerve pain, but it takes 2 weeks to work, so in the meantime I’m relying on my old standbys, extra-strength Advil and whining. However I have been rising from my bed of pain and inconvenience to do the exercises my physiotherapist assigned me, and to pack some boxes of things we are putting into deep storage — the storage space we have rented to put things we won’t need for our temporary home during the build phase. These things include three decorative teapots, some of the dozens of mugs we have managed to accumulate, “plain” martini glasses we bought for our yearly martini parties (from the dollar store, cheaper than renting! ), a set of lager glasses (drink from the bottle! ), and flower vases (no frou-frous at the temporary place!). Then yesterday, DH picked up the van he had reserved from ZipCars and doing all the (literally) heavy lifting, managed to fill the entire thing and then regurgitate its contents into the storage space. I stood by and gave him the benefit of my opinion. We also made a stop at the bike repair shop where he is getting his old, classic bike reconditioned, and some side trips to the transfer station, then to some recycling depots when we found the transfer station would not take old tires or old paint (who knew?). And now our condo storage space is empty and ready for more packed boxes. We thought it would take two hours, it took four. Luckily, DH was able to extend the reservation on the van on the spot with his cell phone. Also unlock and lock the van with his cell phone. When DH was using his cell phone to unlock the van, he stood beside the van, the signal travelled up to a satellite, then back down to the van he was standing beside. It’s funny to think of that. 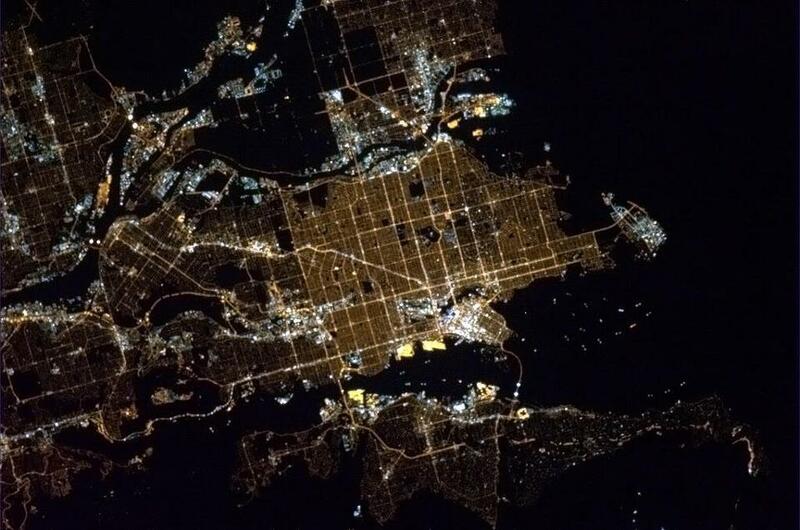 It’s a picture of Vancouver, taken from the ISS by our own Canadian satellite jockey, Chris Hadfield. I joked to a friend that I could see my house — but you know, I can! 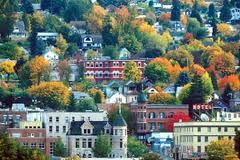 It’s easy to pick out which main streets are which, and work out approximately where our building is.